I’ve never been to Napa, but I have indulged in a few of their selections. And it’s usually been a good experience. I don’t believe in accidents or coincidence, so coming back from a recent ski trip a couple of Saturdays ago (1/24/15), I find myself at one of my favorite wine stores, College Square Liquors, in Westminster, MD. 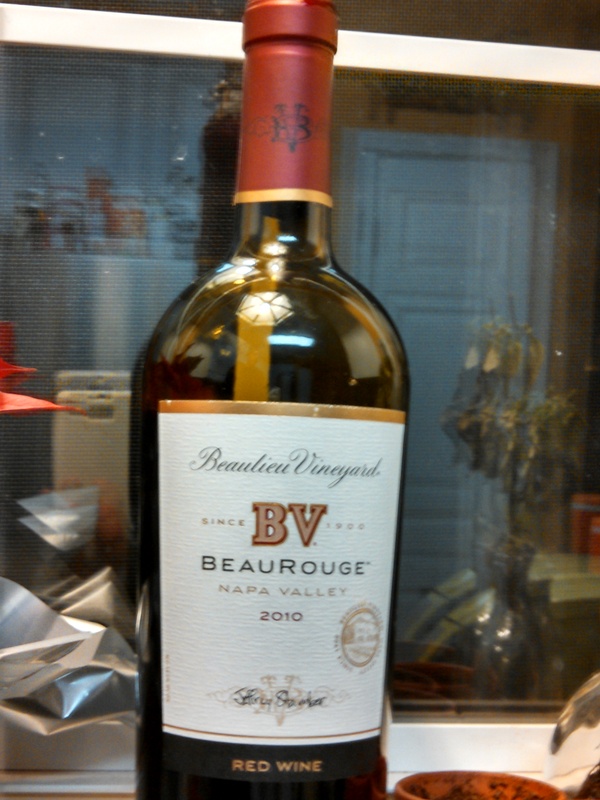 The 2010 BeauRouge from Beaulieu Vineyard is a delicious mix of eight grapes. Cabernet Sauvignon is most prominent, maybe because it’s the fullest of the reds included. The other seven are : Merlot, Zinfandel, Syrah, Tempranillo, Petit Sirah, and two new ones for me – Touriga and Charbono. The latter two I will need to do more research on. In the indoctrination process of Napa Wines, or more complicated blends, maybe this isn’t one of the early ones I should be drinking. But as the old cliche goes, you gotta start somewhere. So I welcome the simple ones and the even more intense blends to come. When it comes to California wines, it’s a lifelong learning process that I look forward to. I may never learn everything, but I am looking forward to gaining all the knowledge I can. This is going to be a fun ride. One of the most important things to note is, I got this bottle for only $16.99. This is a good deal. The vineyard’s own website lists it at $32.00. Most retailers, I have looked at online, have it around the $20.00 mark give or take. I cannot tell you how many great wines I have bought at below cost, that are worth what they are regularly priced. My preference is to buy all my bottles at under $20.00 if I can, with exceptions to the rule. This would be one of those exceptions. I look forward to trying more from Beaulieu. And one day, it will hopefully be a memorable stop when I tour Napa.